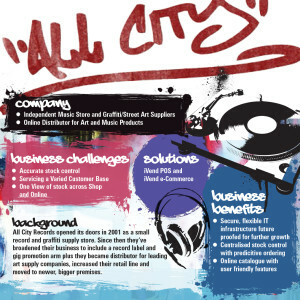 04 December 2015 – Watlington, Oxfordshire, UK – Ireland’s oldest independent music store and record label, All City Records, has streamlined management of stock across its sales channels and enabled a more personalised customer experience thanks to a multichannel retail solution from IT services provider, TRC Solutions and integrated retail system provider, iVend Retail (part of CitiXsys worldwide). The solution provided All City with a real-time, single view of stock, enabling it to more efficiently manage inventory across its online operation and bricks-and-mortar store. For a business with a large portfolio of products that are sold both to trade customers and direct to consumers, each product has a different price point for each audience. The retail solution afforded All City a centralised visibility so they could immediately see available stock and associated pricing in each channel. What’s more, with predictive ordering analytics issuing automated warnings when stock levels become low, the solution streamlined the process for reordering stock to save time consuming stock checks and ensure product availability for shoppers. With a diverse customer base, All City wanted to better target the demands of its target audiences with a more personalised approach. The eCommerce module from iVend allowed the music store to present a wider array of products on its website, which recognised the individual requirements of each shopper segment. All City Records is now looking to further integrate its offer, rolling out a credit card system with the iVend multichannel point of sale solution, to offer secure and flexible payments.